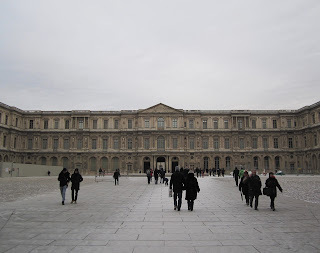 The completion of the Louvre courtyard was begun during the reign of the Sun King, Louis XIV, but was abruptly abandoned when the royal court moved to Versailles. Some of the facades were at least partially completed but the actual structures were left unfinished and some parts were not even roofed. It was only when Napoleon came to power that the final pieces came into place. Development proceeded in fits and starts even in the late 17th century. Louis le Vau was officially the king's architect and successor to Lemercier, but much of his efforts were undone only a few years after they were first completed. Le Vau initially began by following the pattern set by Lescot and Lemercier. As the latter had done with the west wing, le Vau placed a domed pavilion at the centre of the river front and extended the wing by duplicating the existing facade by Lescot. He also copied Lescot's original corner pavilion to maintain symmetry. However, unlike the central pavilion of Lemercier’s west front, which was quite plain and remained so until the late 1850s, le Vau used engaged corinthian columns across the ground and first floors. These were topped with statues in a manner employed by le Vau elsewhere, such as at the garden front of Vaux-le-vicomte. In introducing orders on the Louvre’s river front, le Vau established a new precedent. It seems safe to assume that his purpose was to create a counterpoint to the College des Quatre-Nations, which the same architect had built on the opposite side of the river. We know that le Vau planned a bridge as part of this urban set-piece, but the current Pont des Arts is from 1984 and the earliest bridge at this location was completed in 1804. Le Vau also began work on the north and east wings and made substantial changes to the Petite Galerie and Tuileries Palace. However, in 1664 Jean-Baptiste Colbert was named superintendent of royal buildings and ordered le Vau to halt construction. The task of completing the palace was then opened up to other architects, including the sculptor Gianlorenzo Bernini who was invited to Paris in 1665. The main concern was the design of the east front, which was considered the most important as the main facade toward the city. After a bit of the toing and froing, a project designed by committee; including Louis le Vau, Claude Perrault and Charles le Brun; was approved. The committee had presented two projects, one of which included a colonnade. The latter was chosen and construction began in 1667. Most of the colonnade had been built by 1670 and some of the decorative work was completed in the period up to 1678, including the corinthian capitals of the columns. The central pediment was installed in 1672-74 and was supposed to be surmounted with a statue of Louis XIV and two allegorical deities. Most of the statuary and relief work was not completed during this period, however. Jacques-Germain Soufflot proposed a design for the pediment in 1757 but it was only in 1808 that a project actually came to fruition. The design by Francois Lemot contained a bust of Napoleon, which was later replaced with one of Louis XIV. The relief over the arch was done by Pierre Cartellier in 1810. The monogram for Louis XIV was two mirrored Ls but the originals were removed during the revolution and later replaced with N for Napoleon. This was then changed back after the Bourbon restoration, though some are still accompanied by a bee, which was a symbol of Napoleon. The double LL can also be seen on the south and north fronts. Le Vau died in 1670 and was busy with the design of Versailles during the last years of life. Colbert also seems to have favoured Perrault from the start, and he therefore quickly became the lead on the project. One of his first new proposals was to introduce a full top story on the courtyard of the east wing. Perrault had apparently intended to use a new order for capitals, which he had invented and named the French order. This was necessary to respect the rules of classicism, which proscribed that none of the existing orders could be used above the Composite. The latter had already been used on the first floor. However, a conventional Corinthian was used when the courtyard facade was restored and repaired in 1757-59. The colonnade also had to be repaired during this period after decades of neglect and it was even at one point considered to tear the whole wing down and build anew. The relief in the pediment on the courtyard was done by Guillaume Coustou, but was modified to remove its royal symbol during the revolution. The Colonnade was not only taller than the three other wings of the courtyard but was also longer, which created a mis-match with the north and south fronts. Perrault, therefore, proposed to extend the width of the south wing and produced a new design to replace the earlier one by le Vau. The new facade was initially just a screen in front of the existing building. The design is similar to the colonnade but uses pilasters instead of columns in the round. The decoration of the central pediment was completed in 1809 by sculptor Auguste Fortin. The relief work below was completed in the same year and originally featured a bust of Napoleon. This was later replaced with a helmet of Minerva. Le Vau had continued Pierre Lescot's design on the courtyard, which included attic storeys, but this was replaced with a new full top storey in 1806. The north front was the last of Perrault's designs to be completed. 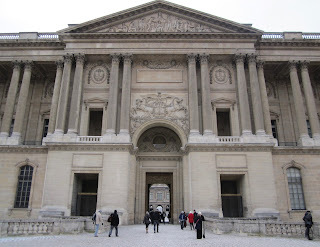 Jacques-Germain Soufflot had worked on the passageway in the 18th century but it was only during Napoleon's time that the facade was brought to completion. Unlike the south wing, the north was never widened on the basis that the discrepancy wouldn't be as noticeable due to the proximity of neighbouring buildings. The decoration of the main pediment was completed just after the fall of Napoleon, by a sculptor named Montpellier in 1815.